The Drive Medical Bobcat 3-Wheel Compact Transportable Scooter is a lightweight mobility scooter that comes in a sleek red color and packs a heavyweight punch when it comes to comfort, performance and value. The new Bobcat X3 is the perfect entry-level scooter providing mobility that is comfortable, reliable and affordable to a wide variety of users. This 3-wheel model also boasts a wealth of features that take it a step beyond basic transportation. --Dimensions (L x W): 42" x 19.25"
--Floor-to-Seat Height: 17" - 19"
--Seat Dimensions (W x D): 16.5" x 13.5"
--Battery Weight (pair): 18 lbs. --Heaviest Piece Weight (Front Section): 28 lbs. The Drive Medical Bobcat 4-Wheel Compact Transportable Scooter is a lightweight mobility scooter that comes in a sleek red color and packs a heavyweight punch when it comes to comfort, performance and value. The new Bobcat X4 is the perfect entry-level scooter providing mobility that is comfortable, reliable and affordable to a wide variety of users. This 4-wheel model also boasts a wealth of features that take it a step beyond basic transportation. --Heaviest Piece Weight (Front Section): 38 lbs. Offers maximum safety and stability; supports up to 300 lbs. E-Wheels EW-18 Stand-N-Ride 3-Wheel Electric Mobility Scooter - Blue - This electric mobility scooter is a simplified electric scooter. This model scooter is a work-horse, with a smooth ride that ships fully assembled and ride ready for ultimate convenience. 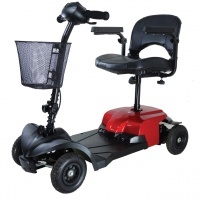 This new and improved 3 wheel mobility scooter is a top quality, stable and easily maneuverable scooter designed for a variety of recreational and commercial applications. This electric scooter averages a 20-25 mile range on a single charge and speed range up to 15 mph. The EW-18 is an excellent choice for warehouse applications, school/college campus, enclosed residential communities, shopping complexes, enclosed parking garages, security officers for patrol, or just about any application where you need silent (no emission) transportation. Unlike other mobility scooters, this simplified mobility scooter is capable of carrying up to 300 lbs. 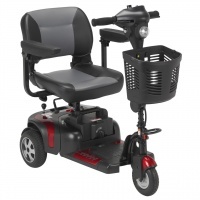 It is ideal for use by pre-mobility candidates as a stand-up scooter or comfortably seated on an optional removable scooter seat. --FRONT WHEEL SIZE: 16/2.125 in. --REAR WHEEL SIZE: 4/2.125 in. --WEIGHT WITH BATTERIES: 78 lbs. The E-Wheels EW-18 Stand-N-Ride Scooter is a simplified electric mobility scooter work-horse with a smooth ride that ships fully assembled and ride ready for ultimate convenience. This new and improved 3 wheel electric mobility scooter is a top quality, stable and easily maneuverable scooter designed for a variety of recreational and commercial applications. With a 20-25 mile range on a single charge and speed range up to 15 mph, the EW-18 is an excellent choice for warehouse applications, school/college campus, enclosed residential communities, shopping complexes, enclosed parking garages, security officers for patrol, or just about any application where you need silent (no emission) transportation. Unlike other mobility scooters, this simplified mobility scooter capable of carrying up to 300 lbs. 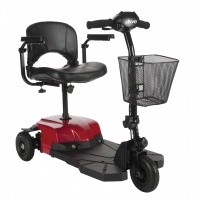 It is ideal for use by pre-mobility candidates as a stand-up scooter or comfortably seated on an optional removable scooter seat. 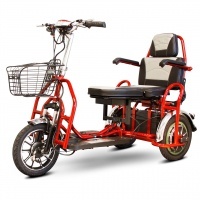 EWheels EW-02 Folding Heavy-Duty Bariatric Scooter folds for storage or easy transportation.